When he came out of school he went up the rocky hill which lay near the village. Here there was a shrine dedicated to the martyr St. George. The Saint would guide him to the spot appearing visibly before his eyes in the form of a young man. Entering the shrine Theodore would sit down and busy himself with the study of the Holy Scriptures; and after midday he went back to the school and returned home in the evening. When his mother inquired why he had not appeared at dinnertime, he tricked her saying either that he had not been able to say his lesson and was therefore kept in; or that he had a pain in his stomach and therefore had no appetite. So she again sent word to the master to send him home with the others, and he replied that since he had received her message he always did send him away with the others. Then she found out that he went up to the shrine and so she sent some of her servants to fetch him, and they brought him down to her. She threatened him and told him to come straight home from school to her; but he continued to act as he had been accustomed to do. His mother was very troubled about him, but in spite of all her threats and advice she was quite unable to make him change his fixed purpose, or to break the rules of abstinence which he had prescribed for himself. When he was about twelve years old an epidemic of bubonic plague fell upon the village and it attacked him along with the others so that he came near to dying. They took him to the shrine of St. John the Baptist near the village and laid him at the entrance to the sanctuary, and above him where the cross was set there hung an icon of our Saviour Jesus Christ. 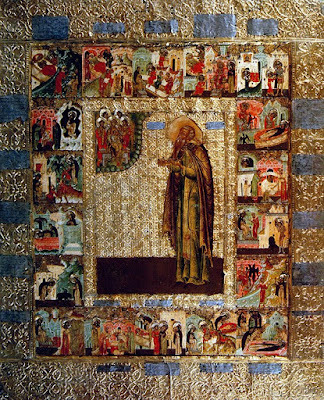 As he was suffering great pain from the plague suddenly drops of dew fell upon him from the icon, and immediately by the grace of God, freed from his suffering, he recovered and returned to his home. As Theodore was sleeping at night with his mother and the women who lived with her, Christ's martyr, George, came to him, and, steeping all the others in deep slumber, woke him up. The first few nights he came in the form of the Stephen whom we have already mentioned, and later, in his own person, and said to him, 'Get up, master Theodore, the dawn has risen, let us go and pray at the shrine of St. George'. Theodore got up readily and with great joy and the Saint led him away from the house up to his shrine, while it was still dark, so that the boy beheld some of the temptations caused by the demons, for the wicked demons, the enemies of truth, appeared on either side of him in the semblance of wolves and other wild beasts, and with gaping mouths they rushed upon him as though to kill him, in order that they might cause him through fear to give up his good purpose. But Christ's martyr took hold of him and, like a man wielding a sword, chased them from him, so that Theodore was no whit alarmed by the sight of the wild beasts but became even more zealous and never missed his visits to the shrine. When he began to adopt this habit, his mother and the women sleeping with her would wake up in the morning, and not seeing him in his bed they suspected that he had crept out and was spending the nights in the martyr's shrine; and they wondered how it was, since he slept between them, that he got out so successfully without anybody noticing it. They were afraid he might be devoured by some beast, since a fierce wolf, which carried off children, had lately been haunting the neighbourhood; so they tried to coax him not to go up to the shrine, at least before sunrise, as it was a wild, and fearsome place. However, the boy would not be persuaded and when awakened by the martyr at the appointed hour he went off to the shrine. When the women did not find him in bed in the morning, they became very angry and sent servants who brought him back dragging him by the hair. His mother whipped him and tied him to the bed with his arms behind his back, and gave him no food. 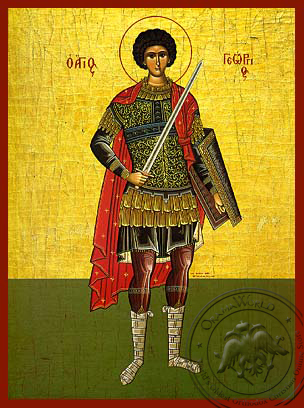 That night God's holy martyr, George, appeared to Theodore's mother and the other women, girt with a sword, which he drew as he came towards them saying threateningly, 'Now I shall cut off your heads because you ill-treat and punish the boy and prevent his coming to me'. On their swearing solemnly that they would never do it again, he took back his threat and disappeared. Now when the devil, the enemy of truth, saw that Theodore was industriously acquiring the spiritual weapons of virtue against him, he determined to destroy him. Accordingly one day he assumed the appearance of one of Theodore's school fellows, Gerontius by name, and took him and led him up to the cliffs of a place called Tzidrama, and, setting him on a lofty crag of the cliffs there, put the temptation to him which was put to our Saviour, and said. 'If you are willing, master Theodore, to display your powers of conquest, display them here and jump down from this cliff.' But Theodore looked at the height which was really great and said to Gerontius, 'It is high and I am afraid'. The devil said to him, 'In the eyes of all the boys you are considered braver than I, and you outshine me, but in this matter I am no coward and will throw myself down'. The boy answered him, 'Don't do it! You may lame yourself, or even be killed'. As the other asserted he could do the feat without any danger, Theodore finally said to him, 'If you will, then I will too'. So the devil standing with him on the rock jumped down, and alighting on his feet shouted up to the boy Theodore, saying 'See, I have done it! If you dare, come down too, that I may see your bravery: if you can, as in all else, distinguish yourself in this test too'. Whilst the boy stood debating within himself full of fear at this utterly useless ordeal, and staggered at the boldness of the supposed Gerontius, who had never previously been so bold, George, the martyr of Christ, suddenly appeared and taking Theodore by the hand, led him away from the place, saying, 'Come, follow me, and do not listen to the tempting of him who is seeking your soul; for he is not Gerontius but the enemy of our race'. And so saying the holy martyr brought him to his oratory. So then Theodore, the most holy servant of God, was deemed worthy of the priesthood by our Saviour God at the age of eighteen, and with godly wisdom he strove to show himself like unto a prudent man in accordance with the Lord's appointment, praised be His name. * Thus he left his parental home which was built upon sand and all the earthly things therein, resolving within himself never to set foot in it again and in full assurance of faith he devoted himself body and so and with a sincere heart to God. Through the grace bestowed on him by God Theodore continued to work many miracles against every kind of illness and weakness, but especially did he make supplications to God for aid against unclean spirits; hence, if he merely rebuked them, or even sent them a threat through another, they would immediately come out of people. Some persons were so profoundly impressed by these miracles that they left their homes, journeyed to him, and entering upon a life of contemplation Joined the monastery; others again who had obtained healing would not leave him but stayed with him, giving him such service as he needed. Now since the oratory of the holy martyr George was small* and could not contain those who recited the offices as well as those who stayed with the Saint and others* who came up to pray, he built on its right hand side a very fine house (dedicated to Michael, the holy commande-in-chief of the angels) which was comfortable both in winter and summer; on its left it had a small oratory dedicated to St. John the Baptist, and one on the right dedicated to the most blessed Mother of God, the ever-virgin Mary. In this house he ordained that the community of Brothers should officiate in order that both those who were waiting either to be healed of an illness, or for the expulsion of evil spirits, and those who had come up to pray, might rest awhile in the hallowed church of the Archangel which was open day and night, and listen to the service and join in the prayers and find healing. Maurice went up with his brother Peter and his attendants and fell at the Saint's feet and begged him to pray for them that their journey to the Emperor might have a happy issue. The blessed and glorious man bade him stand up and prayed to God for him, as if by divine revelation he said to Maurice, 'My son, if you bear in mind to pray to the holy martyr George, you will shortly learn to what glorious post in the Empire you are called; only, when you reach those heights be sure to remember the needs of the poor'. When Maurice asked to know precisely what dignity he meant to which he should be called, the Saint led him apart from his companions and told him plainly that he would become emperor. After Maurice and all the men with him had received the Saint's blessing he left with joy and reached Constantinople. And according to the Saint's prophecy Maurice succeeded to the imperial throne on the death of Tiberius, and remembering Theodore's words he sent him a letter asking him to pray for him and for his Empire that it might be preserved in T peace and untroubled by enemies and bade him make any request he liked. The blessed man sent the most blessed Philoumenus, the abbot, to the Emperor and also wrote a letter in order to secure some small gift of food for the monastery to meet the needs of the poor who looked to them for support. On receiving the letter the Emperor made a grant to the monastery of 200 modii of corn annually, and sent it to him together with a chalice and a paten. When the blessed man saw the vast crowds that assembled and realized that the chapel of St. George was too small, he gave the rest of the money he had inherited to build a church worthy of the holy martyr George with three apses and an oratory on the right dedicated to the holy martyr Plato. He therefore laid the matter of his resignation before St. George in prayer and besought God that he might without condemnation deliver up his bishopric. He received assurance that his request was granted. So he summoned a meeting of the clergy and landowners of the town. They had refused to listen to his protests, he said, and had persisted in making him their bishop, though he knew that he was unfitted for the government of the church. 'And now this is the eleventh year that I have troubled you and been troubled by you, I beseech you, therefore, choose for yourselves a shepherd in whom you may find satisfaction, one who can take charge of your affairs.' As for himself, henceforth he was no longer their bishop, but as a humble monk he was returning to the monastery in which he had vowed to serve his Lord all the days of his life. Bidding them farewell he set out for the capital of the province, Ancyra, taking with him John, the archdeacon of his monastery. The blessed man greatly longed to find some relics of the glorious and victorious martyr George, and prayed to the latter to satisfy this longing. Now Aemilianus, the very holy bishop of Germia, had a piece of the martyr's head and one finger of a hand and one of his teeth and another small piece. So the martyr appeared to the bishop and exhorted him to give these relics to his servant Theodore for the church that the latter had built in his honour. The bishop sent to the monastery to the servant of God and invited him to come and offer up prayers in the venerable church of the Archangel in order that he might welcome him and give him the much-desired relics of the martyr. Theodore was filled with joy by this promise and left the monastery and went to the town of Germia and offered up prayer in the church of the Archangel. The very holy bishop, Aemilianus, welcomed him warmly, and then conducted him to the monastery of the Mother of God, called of Aligete. At that time there was a great drought in the metropolis of Pessinus and the fruits of the trees and crops were withering. Consequently when the men of that metropolis heard that the servant of God, Theodore, was the guest of the Bishop Aemilianus in the monastery of Aligete, they hastened to him. Their headmen (domestikoi) and the clergy and a goodly number of the people came to this monastery of the Mother of God-a distance of some fifteen miles-and after receiving permission from the Bishop Aemilianus they took the servant of Christ and led him to their own city in order that they, too, might entertain him and that by his prayers their country might obtain rain from heaven. Now there was a garden about six miles from their city, and in this garden was a swarm of locusts which were ruining all the young vegetables. When the owner of the garden heard of the inspired man's approach he ran a distance of three miles from his garden to meet him, and falling at his feet, told him of the damage which the locusts had done to his garden. Theodore said to him, 'Go, son, and bring me some water in a pot'. So the man ran and fetched some water from the river close at hand and brought it to him. After the servant of God had blessed the water, he gave it to him, saying, Go back and water the four corners of your garden with this and the Lord will fulfil thy desire'. The man returned to his garden with all speed, and did this; and when he returned to the spot which he had watered first, he did not find a single locust. He went out again in the evening and found in the same way that all the locusts had vanished, so he filled his hands with all kinds of vegetables and went out in great haste to find Theodore whom he recognized as in very truth a worker of miracles. And leaving Amorion he came to Sozopolis; and as he was on the point of entering the church of the Mother of God, behold! there lay a man stricken of palsy by a demon, for the unclean spirit had lain concealed in him for several years and had not shown itself, for the ever-Virgin Mother of God was reserving this great miracle for her servant. At that minute the paralytic suddenly leapt up and began to be tormented and met Theodore with these cries, 'Oh violence, why have you come here, iron-eater, with George the Cappadocian to my open shame? I have lain hidden so many years, and now through you I am found out!' and all who saw it were filled with amazement. But the blessed man rebuked the unclean spirit by prayer and by the sign of the Cross and cured him who had been paralyzed. This holy, thrice-blessed and saintly servant and faithful follower of Christ, Theodore, died in the third year [613 CE] of the reign of our pious and Christ-loving Emperor, Heraclius [610-641 AD], and in the first year of the reign of his divinely-protected and divinely-crowned son Heraclius, the new Constantine, the eternal Augusti and Emperors, in the first indiction in the month of April at dawn of the twenty-second day, a Sunday, it being the first Sunday after Easter. May we find mercy at the judgment-seat of Christ our God through the prayers and intercession of this Saint, and may we be deemed worthy of the Kingdom of Heaven together with him and with all those who cherish his memory, to the glory of our Saviour Jesus Christ; with Whom to the Father and to the Holy Spirit be glory both now and for ever and world without end, Amen!